Sound Important Points: Hi Viewers in this post us are sharing the Information of the Sound. In general physics one of the most important topics is sound. 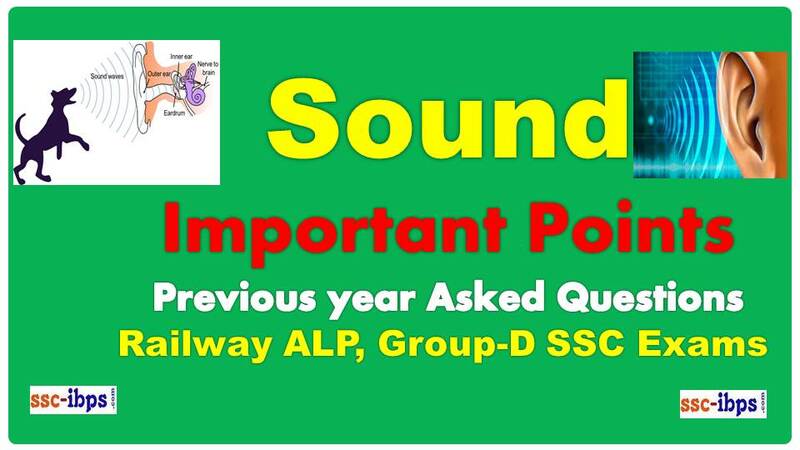 Questions from the topic Sound wave can be seen in the all competitive exams. 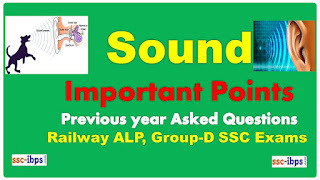 Those who are seriously preparing for the Railway, Staff Selection Commission written examination sound study notes is very useful for your preparation. Don’t Neglected to prepare this topic if you are preparing for government exams. Below this post having some previous year asked questions in different exams. Sound is defined as vibrate the travel through the air or any other medium and can be here by human ear or animals ear that is called sound. Sound waves are longitudinal mechanical waves. Sound waves are produced by compression and rarefaction of the particles of the medium. Sound needs a medium to travel. The speed of sound is the maximum in solids, less in liquids. Sound waves are reflected, refracted, and diffracted, and exhibit interference. Study of sound is called Acoustics. Measurements of sound are Decibels (DB). Sound cannot travel through vacuum. Sound Travel with a speed of 332 m/s at 0 C.
The speed of propagation of the sound waves is dependent on the wave frequency. The Longitudinal Mechanical waves frequencies range is 20 HZ to 20000 HZ (200 KHZ) are called audible waves. These are sensitive to human ear. The Longitudinal Mechanical wave’s frequencies range is below 20 Hz is called Infrasonic Waves. The Longitudinal Mechanical wave’s frequencies range is greater than 20000 Hz is called Ultrasonic Waves. Humans cannot hear the sound of inaudible range. In a medium, speed of sound basically depends upon elasticity and density of medium. It is defined as amount of energy passing normally per unit area. SI Units of Intensity is Watt/m2. Pitch is the characteristics of sound which distinguishes a sharp sound from grave sound. It is the characteristics of sound which enables us to distinguish between sounds produced by two sources have the same intensity and pitch. The sound waves received after being reflected from a high tower or mountains is called echo. To hear echo, the minimum distance between the observer and reflector should be 17m (16.6 m). Persistence of ear (effect of sound on ear) is 1/10. It is defined as the ratio of speed of sound source to the speed of sound in the same medium under the same condition of temperature and pressure. Shock wave is defined as body moving with supersonic speed in air leaves behind it a conical region of disturbance which spreads continuously. Such a disturbance is called shock waves. When a motor boat travels faster than sound, then waves just like shock waves are produced on the surface of water. These waves are called bow waves. If there is a relative motion between source of sound and observer. The apparent frequency of sound heard by the observer is different from the actual frequency of sound emitted by the source. This phenomenon is called Doppler Effect.